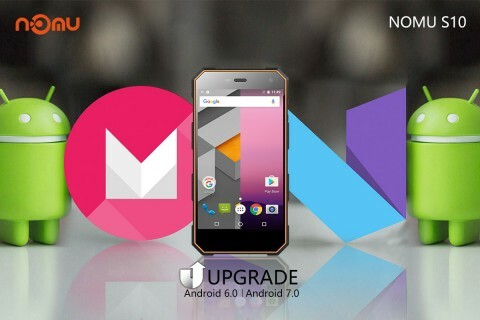 Nomu has begun to release the latest update to Android 7.0 Nougat for the Nomu S10. you can now install the official android 7.1 nougat firmware manually. Nomu has begun to release the latest update to Android 7.0 Nougat for the Nomu S10 . Initially, the device was shipped with the pre-installed Android 6.0 Marshmallow operating system, but the manufacturer promised to release an update for this device. True, you can now install the official android 7.1 nougat firmware manually, by following the instrustions below. First, you will need to download a new firmware from the official website of the company below. Then you will need a special utility, like SP Flash Tool, to install the update on your smartphone. If you have never done such a thing or are afraid to do something wrong, then in the next few days Nomu will release a video instruction, which will show in detail the process of installing the firmware. Inexperienced users should wait for automatic updates "by air OTA. These years, most phone brands start giving some priority on the water-proof function, but it’s not good. When the phone dropped into water, it dooms to be dead. Choose water-proof phone, NOMU phone is always the best. NOMU is famous for high-quality rugged phone. It has produced rugged phone for years. The phone is very professional, and very reliable. I’m a royalty fan of NOMU, support the sale, support NOMU. Hope NOMU can produce phone with high camera pixels. Always 8MP, should be higher. Except for this, the rest is satisfied.